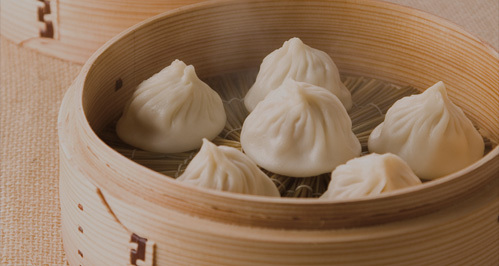 NANSHO-MANTOUTEN | a long-established xiǎolóngbāo specialty restaurant priding the greatest recognition and delicious taste out of all of Shanghai. A flagship store of Nasho Mantouten at Yuyuan (Yuyuan Garden) in Shanghai reopened. The flagship store of Nasho Mantouten at Yuyuan in Shanghai reopened on 26th October, 2018. The first floor is for take-away and the second and third floors are restaurant area. Newly renovated Nansho Mantouten will make further history in Yuyuan, Shanghai. 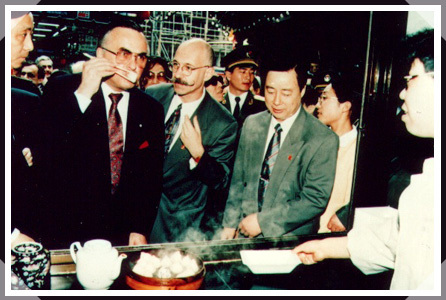 In the year 1900, founder Xiang Sheng Wu opened a restaurant in Yùyuán, Shanghai. 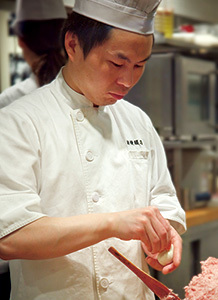 The restaurant was initially named "Chang Xing Lou," but during the 1960s, changed to its current name of "Nansho-Mantouten." 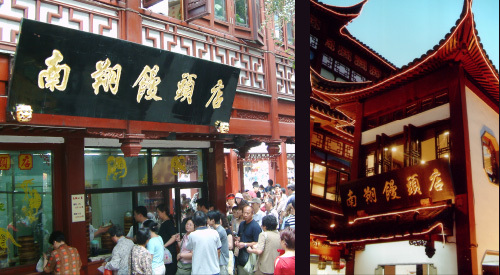 With our xiǎolóngbāo which is distinguished by its characteristic thin skin and voluminous filling, our restaurant is a renowned Nansho xiǎolóngbāo restaurant that still boasts long queues even to this day with over 100 years of history since its founding. As of July 2015, Nansho-Mantouten operates units in Japan, Indonesia, Singapore and Hong Kong. As a gourmet ambassador representing Yuyuan, Shanghai, we are contributing to the dissemination of Chinese gourmet culture. Our restaurant has also been visited by Queen Elizabeth II of the United Kingdom as well as former United States president Bill Clinton and thus beloved by national guests around the world. Our restaurant is beloved by national guests around the world. 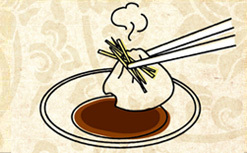 The Secret to the Deliciousness of "Nansho Xiǎolóngbāo"
"The secret to the deliciousness is in the filling." We extract the umami flavor of the filling by combining carefully selected ground pork and the pork rind-derived gelatin which is simmered in broth of chicken and vegetables. 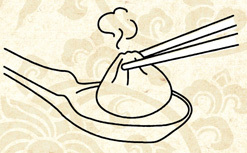 Nansho xiǎolóngbāo is popular for its characteristic "thin skin" "voluminous filling" "mouthful of juice" "beautiful shape"
and is one of the first intangible cultural heritage to be certified in Shanghai. It is a title which is certified by the former Ministry of Trade of the People's Republic of China. It is an indication of an honorable long-established brand of traditional merchandise, technique, or a service inherited over generations along the course of history, and characterized by cultural traditions and backgrounds of the Chinese nation and noted for its high degree of social reliability. It is a trademark certified by the Shanghai Municipal Administration for Industry and Commerce. It signifies a high level of social recognition as well as high quality of the product and a high degree of reliability within the marketplace. It also requires that sales during the most recent three years to be in the top ranks in the industry and a complete system of brand management. It is a cultural heritage that is certified by the Shanghai Municipal Administration of Culture Radio Film and TV, then approved and disclosed by the Shanghai Municipal People's Government. It signifies a traditional, nonmaterial cultural heritage that has been inherited over three generations and 100 years. Please be careful not to burn your mouth as the filling is extremely hot. 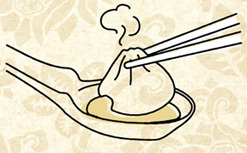 Using your chopstick, gently grab the xiǎolóngbāo and prop it on top of the spoon (careful not to break open the skin). Slightly break open the skin to transfer the soup on to the spoon, and then sip the soup which is full of meat's tastiness. Add some ginger to your liking. Then dip it into the black vinegar soy sauce and enjoy.